Fluffy, airy and delicious. 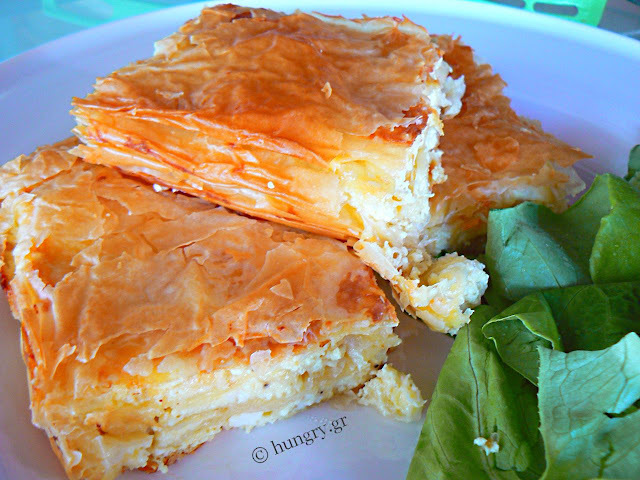 What else can describe a simple pie with a delicious combination of cheese and crunchy crust. It is made fast and is hearty. 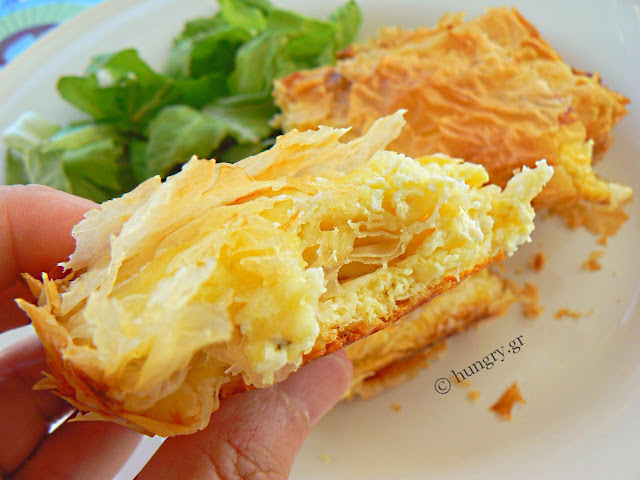 The addition of soft cream cheese keeps the filling juicy and gives this cheese a creamy texture. An hour before preparation remove the crust from the refrigerator to thaw. Grease a baking oven and the rest of the state for the leaves. 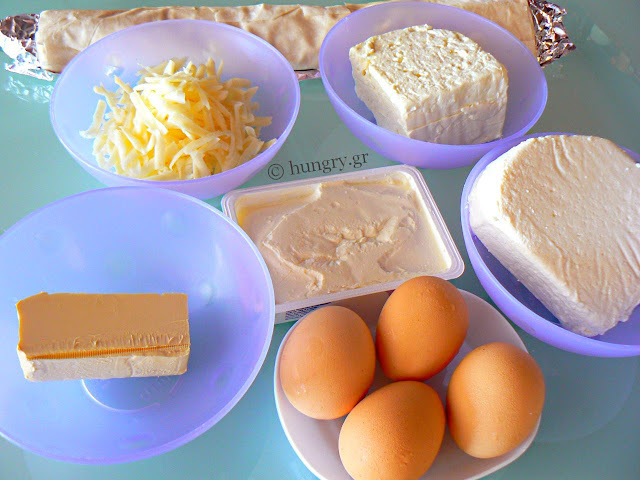 In medium bowl grate the roquefort, feta and ricotta cheese with a fork. 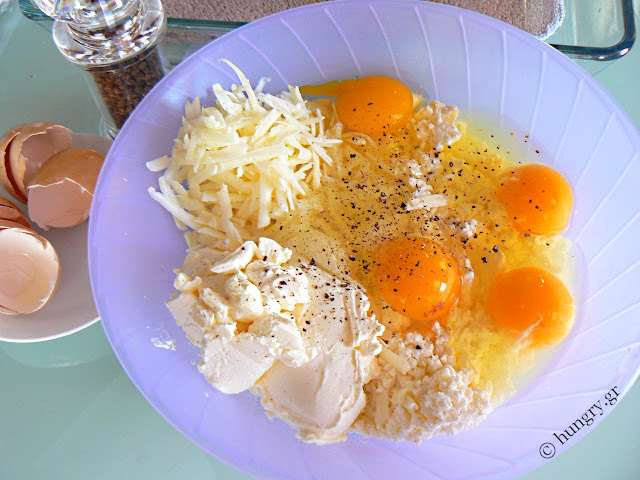 Add the gruyère, cream cheese, eggs and freshly ground pepper. Mix well to homogenize the mixture. 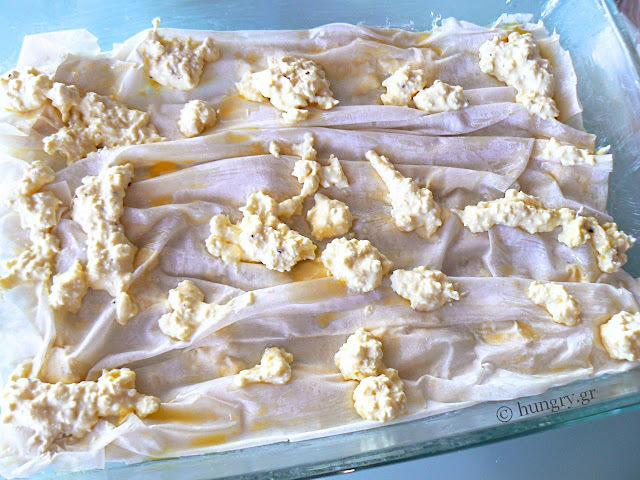 On the buttered baking dish spread wavy three well buttered sheets. Pour spoonfuls of the mixture of cheese scattered across the leaf surface. 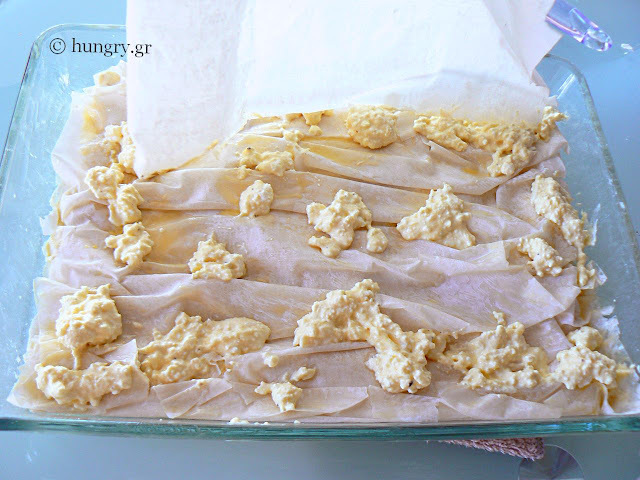 Add other phyllo pastry sheets, buttered, alternately with the cheese filling until it is finished. 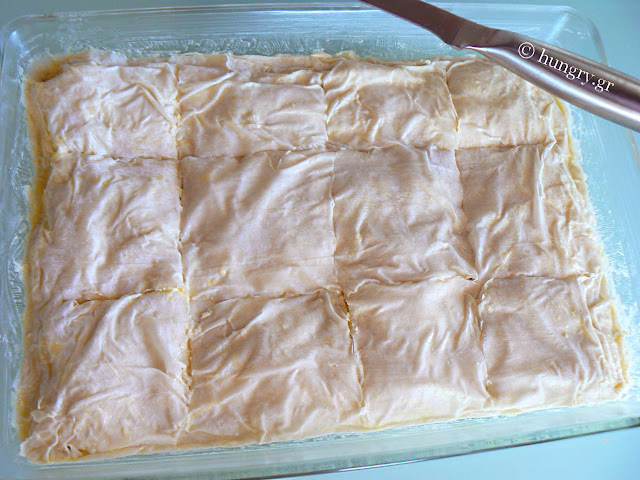 Finally, cover the pie with three more buttered sheets. 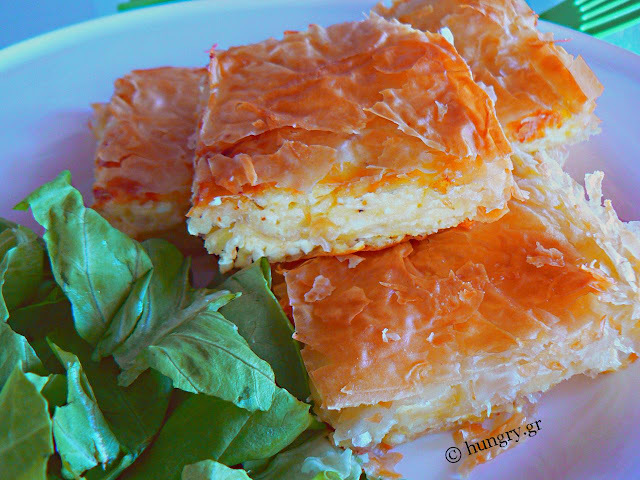 Scratch the surface of the cheese pie lightly and bake in preheated oven at 180°C (356°F, Gas 4) for 40'-45' mins or until cooked through and golden. Remove it from the oven and allow 10 minutes to cool on a rack. To create the wavy sheet state, you keep with both your hands, the cards vertically above the pan, with the longest side facing down, and after touching the foil in the pan lower your hands and following the path of the pan, leave the wavy sheet fall, without stretching. Thus the sheets retain air and the cheese becomes fluffy. If you choose to add blue cheese, I would recommend that you put very little. With its strong presence outweighs the other cheeses and blocks to highlight the flavors. 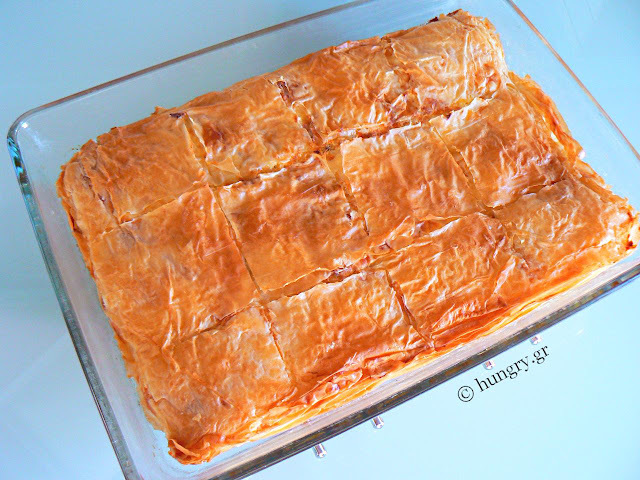 Light, fluffy and juicy pie within a crispy brown crust! Feta cheese and gouda cheese. The first one with salty, spicy flavor and the other soft and sweet. Combined, they give us a well balanced, tasty result.